Another year is upon us, and MVM bring to us more from the Monogatari universe, the anime adaptations of the quirky NisiOisiN light novels, brought to the screen by Studio SHAFT, who layer their own brand of visual quirkiness on top. They are a serious fan favourite anime, and an outlier in that these subtitle only releases, still sell like hot cakes, especially on Blu-ray, where the perceived wisdom is such anime will not sell at all. Quite frankly, I’m a little overwhelmed when it comes to the Monogatari franchise, so this might be a good place to pause, and take stock of the state of play with regards to the UK releases. In 2013, we kicked things off with the original Bakemonogatari series, 15 episodes released in two collections, and subsequently re-released as a complete collection, which introduced the characters and their wacky world as seen through the eyes of protagonist Koyomi Araragi. This series contains 5 story arcs. At the end of 2013 crossing into 2014, we got the next series Nisemonogatari, 11 episodes which focused on Araragi’s siblings, the Fire Sisters Tsukihi and Karen. This contains two arcs. Again this was released in two parts, and then as a complete collection. 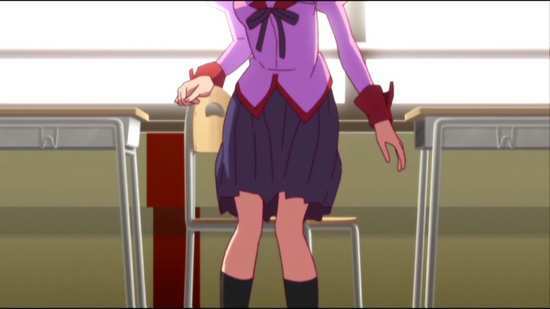 Also in 2014, we got Nekomonogatari Black, a four episode arc which could be seen as an OVA release, but is still part of the ongoing story, a prequel arc that looks at how character Tsubasa Hanekawa became so afflicted with her particular curse. At the end of 2014, and reaching into the first quarter of 2015, we got the 26 episode Monogatari Season 2, released as five separate arcs, the sequel Nekomonogatari White, Kabukimonogatari, Otorimonogatari, Onimonogatari, and Koimonogatari, continuing the stories of characters introduced in Bakemonogatari and Nisemonogatari, and taking us all the way to Araragi and Senjyogahara’s graduation from high school. And that is where we stand at the moment. It’s hard to believe that it’s been a calendar year since the last Monogatari release, but we do have to wait for them to be actually made. This disc is the next in the franchise, Hanamonogatari, set after Araragi’s graduation, and focusing on the character of Suruga Kanbaru. At this point that leaves Tsukimonogatari, a four-episode arc set before this title but after the second season, and a twelve episode series adapting more in this timeframe called Owarimonogatari. Oh, and there is a trilogy of prequel films called Kizumonogatari, the first of which has been released in cinemas this winter. Don’t ask me about the Koyomimonogatari web anime series! Hanamonogatari presents itself as a story about Suruga Kanbaru’s stupidity. She’s the former basketball player who was cursed with a monkey paw in Bakemonogatari, after seeing her beloved upperclassman Senjyogahara getting close to Araragi, and letting jealousy overwhelm her with devastating consequences. Now that they’ve graduated, Suruga has started her final year of high school, which is when Ougi Oshino, who is a boy, not a girl, comes to Suruga with ominous rumours of a Lord Devil granting wishes for school students. Suruga’s first concern is that it’s actually her, but after investigating she finds what looks like a rather mundane answer. It’s actually a former basketball rival from another school, a girl called Rouka Numachi, although the rumours exaggerate what she does, and she’s not exactly altruistic. But the next morning, when Suruga wakes up, the monkey paw is gone. Her arm is back to normal! Hanamonogatari tells its story across five episodes, Suruga Devil: Parts One to Five, presented on a dual layer DVD from MVM. It’s also available on Blu-ray. 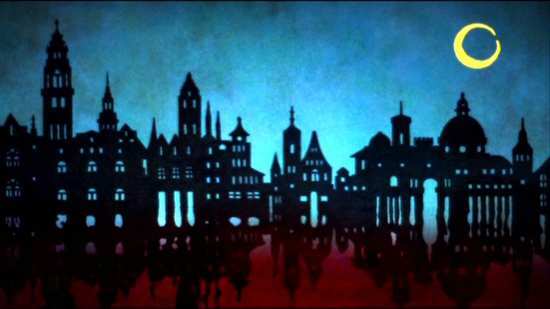 Hanamonogatari gets a 1.78:1 anamorphic transfer in the native PAL format on this DVD. It’s a clear and sharp transfer, rich in detail, with smooth animation, and an absence of artefacts or obvious aliasing. 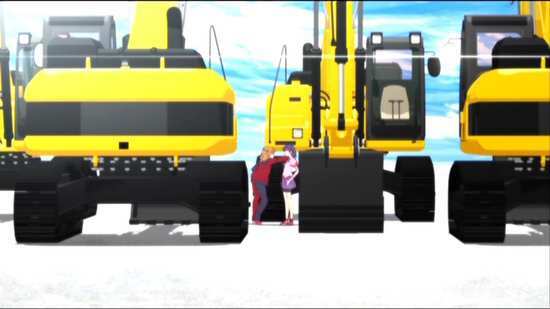 It’s just the image quality you’d expect for a Studio SHAFT animation, one of the Monogatari series. Expect inventive and varied visuals, odd camera angles, lots of characters looking back over their shoulders, and of course the fan service. Also, just like the Bakemonogatari releases Hanamonogatari reveals signs of edge enhancement when scaled up to a large HD screen, making the Blu-ray the obvious choice for those who are capable. The disc presents its contents with a static menu screen. The big extra here is the Episode 5 Alternate Version, which lasts 26:14. To be honest, the only difference that I could see was that the opening and end themes were reversed. I was hoping for a what-if episode with a different outcome or something. 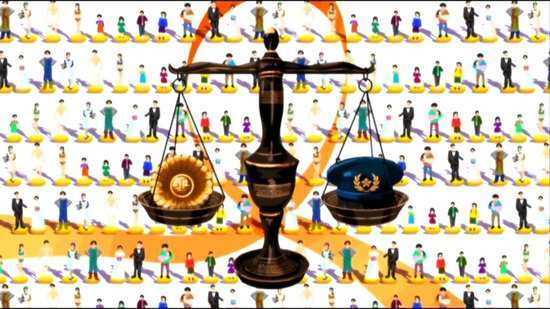 You also get the textless credit sequences, and 5:37 of Promotional Videos and Commercials, 10 of them. I have to admit that I had a few doubts about Hanamonogatari. For me, the joy in the Monogatari franchise has come from the characters and their interactions, even more so than the bizarre supernatural stories. The fun is in partaking of Araragi bouncing off Senjyogahara, or Hachikuji, or Hanekawa, or whatever combination of characters arises. It’s about dialogue, about wordplay, and about fractious personalities. 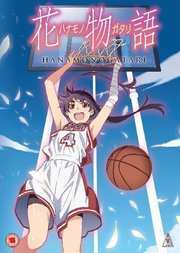 But in Hanamonogatari, the focus is on Suruga Kanbaru, the ex-basketball player with a ‘monkey’ paw for a left hand. For one thing, I have to admit that she is my least favourite character in the franchise to this point, perhaps the most overtly fan-servicey, and not quite as interesting as the others, defined as she is in terms of Senjyogahara. The second thing is that in Hanamonogatari, Araragi, Senjyogahara, and Hanekawa have all left, and Suruga Kanbaru pretty much has to carry this arc by herself. Not a lot of scope for character interaction, I thought. I was wrong. I was very, very wrong. 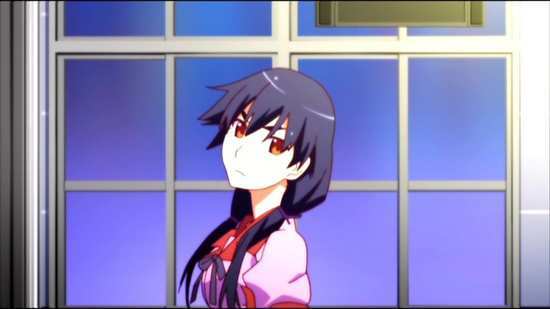 Hanamonogatari is one of the best arcs of the franchise to date, and not only does Suruga Kanbaru carry the arc with aplomb, but the arc really does help in fleshing out and enriching her character and back-story, in the way that most of the other characters have had to this point. My opinion of her has certainly changed, and I very much want to see her earlier story arcs again with this story in mind. As for character interaction, there’s plenty of it in this story, a whole lot of verbal cut and thrust, only it’s between Suruga Kanbaru and a new character Rouka Numachi. Numachi used to be a rival basketball player for another school, only now it seems that she’s gone into the supernatural problem solving business for herself, which might be useful given that Araragi has apparently left. Only it turns out that Numachi’s motives in ‘helping’ people are not at all altruistic, and her methodology leaves much to be desired. 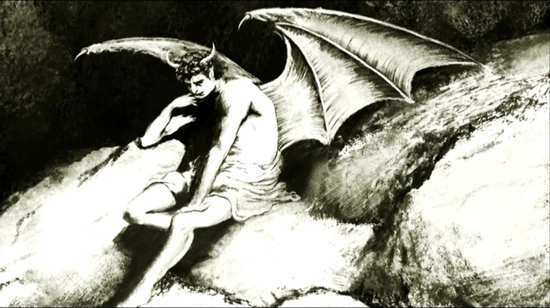 On top of that, when it comes to meeting Suruga, she has ulterior motives, motives which all boil down to the Devil’s paw that has taken the place of Suruga’s left arm this last while. It’s not all a two-header however. 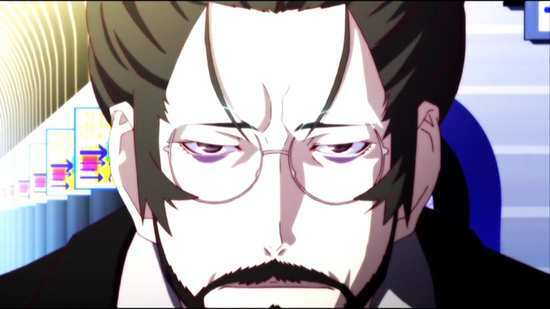 We do get to hear the Fire Sisters, even though we don’t see them, and Suruga has an interesting meeting with Kaiki Deishu (now there’s a story needing to be told, given how he was when we last saw him) when she’s trying to find out more about Numachi, while there is a treat for Araragi fans close to the end of the story. 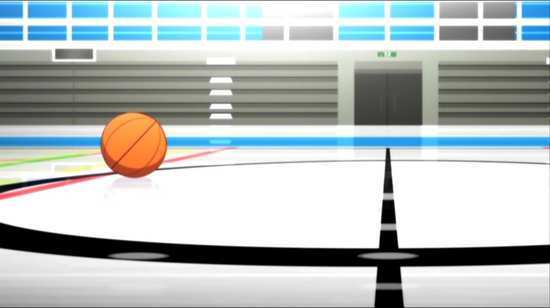 But really, the compelling drama happens between Suruga and Numachi, and given their prior rivalry, it’s no surprise that it happens on a basketball court. 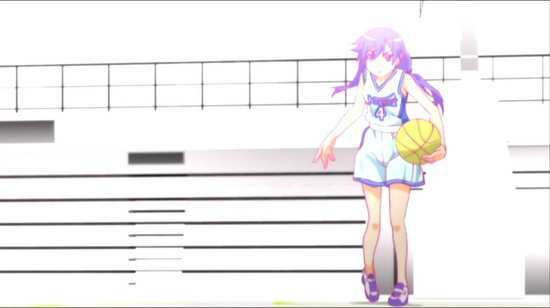 Studio SHAFT may be masters of mood and style, but they’re not too hot on action animation. But while Suruga and Numachi do get to play a little 1 on 1, the animation manages to convey the energy and intense rivalry through strong direction, and excellent editing, even while the action animation itself might be a little mundane. You might have noticed how I’ve managed to avoid talking too much about the story in this review, which given how the Monogatari stories absolutely do not need spoiling is probably wise. You’ll just have to take my word for it that after a slow start in the first couple of episodes, Hanamonogatari turned out to be probably one of the strongest, most compelling, and interesting tales in the franchise to date, and I love what it did for the Suruga Kanbaru character. If you are collecting the Monogatari discs then to get this release would be a no-brainer, and equally so when it comes to getting it on Blu-ray. While the DVD is good, HD is really the way to watch this franchise.